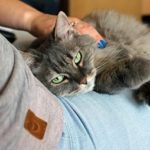 Cat Mate C10 Automatic Pet Feeder Review - Does It Work Well For Cats? (3.4/5) The Cat Mate C10 is an automatic cat feeder that works well if you need a regular scheduled meal for your pet. 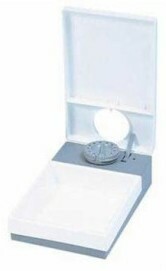 This flip-lid type feeder serves one dry meal at any required feeding time over a maximum period of 24 hours. Wet food could also be served in this feeder within 2-5 hours or little longer, depending on the weather and if the food is placed in the feeder right out the freezer. 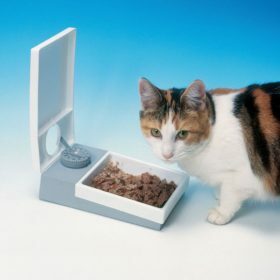 The Cat Mate C10 feeding tray has a capacity to hold 1 lb (450g) wet food. The timer is easy to use and the bowl and lid are dishwasher safe. The feeder requires 1 AA size battery, which is not included. Serves one meal at any selected time within 24 hours. HOW DOES THE CAT MATE C10 WORK? The Cat Mate C10 features a flip type lid and a dial timer that works with a mechanism similar to a kitchen timer (quartz type timer). Even though the timer is similar to the wall clocks, the Catmate C10 timer is virtually silent. As any timer of this kind the accuracy is not exact. 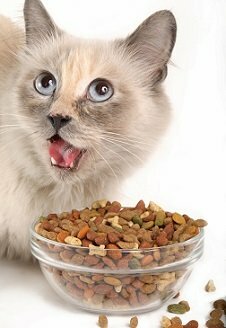 Consequently, if you buy two feeders to feed your two cats most likely the feeders won’t open at the exact time. Consider this important aspect if one of your cats is a vacuum cleaner with food and steals the other cat’s food. The base features a built-in notch that holds down the lid. When the timer rotates and counts down to zero “0” the notch allows the lid to flip up. 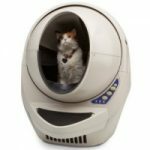 WHAT ARE THE PROS AND CONS OF THE CAT MATE C10? Option to turn it off if you want to feed your cat manually. Good capacity of 1 pound (450 g) wet food. Has to be set every day. It does not have an alarm calling to eat. The feeder is made of lightweight plastic. Make sure to have always fresh batteries. If you have a food-driven cat who is determined to get extra food, you may need to attach the feeder to a board for extra stability. This way, your cat won’t be able to tip the feeder over or move it around to manipulate it. 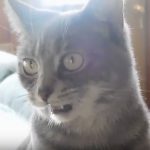 The feeder is suitable to dispense dry food but you can feed your cat wet food within 5 hours or so if you freeze the canned food and place it in the exact shape out of the can, without spreading out the food in the feeder. When setting up the feeder you have to close the lid first and then try to set the dial. The lid has to be positioned correctly when you close and then turn the dial, making sure the hinge is tightly snapped down. The Cat Mate C10 is a very simple concept in automatic feeders that is designed for a specific task: to feed one-time meal for your cat. If you need a very simple delayed feeder, this unit gets the work done and it’s reliable as long as you keep the feeder always with fresh batteries and if your cat is not determined to defeat the unit to get extra meals. To complement other automatic feeding systems. If you want to feed two cats (one feeder each) that cannot eat close to each other. If your cat is very obsessed with food. If you want to feed your cat wet food without being refrigerated. If you want a very exact accuracy in meal time (because timer is not digital). If you have a cat and a dog who is a chewer.